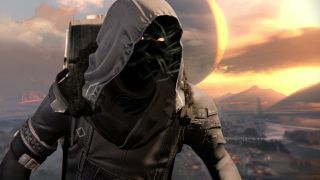 Destiny: Xur weapons, gear, and location, August 11 - 13. Hawkmoon, Telesto, and Nemesis Star! What’s good? Well the Titans’ ACD/0 Feedback Fence is a fun little defensive safety net, throwing out a damage wave every time you take a melee hit. Pretty much made for clobbering Hive Thrall waves, then, though it does of course come with the disadvantage of requiring you to actually get hit in order to trigger its key perk in the first place. The Hunters’ Mask of the Third Man is a solid bet for Bladedancers, given that it extends the duration of your super by making Arc Blade attacks use less energy. It also gives you more super energy for melee kills in PvE, meaning you can trigger those pretty, sparking razors more frequently. As for Warlocks, the Light Beyond Nemesis is the least exciting of this week’s armour line-up, but that doesn’t make it useless. The helmet speed up your revives (going in both directions) and lets you generate an extra orb every time you fire your super. A decent support utility in tough PvP situations, then, but not exactly essential. In terms of guns, Telesto makes another appearance this week, which is basically the universe telling you that you really, absolutely, definitely should buy it if you haven’t already by now. A Fusion Rifle that works more like a sticky grenade launcher, it packs a heck of an area-of-effect kick, and is one of the most fun non-standard guns in the Destiny arsenal. Hawkmoon isn’t the monster it was in its delightfully OP year-one days, but it’s still a pretty mighty contender, packing massive impact, good range, and two stackable perks that add up to extra damage for three random bullets in every mag. And the Nemesis Star, while the least essential of the week’s guns, is still a decent addition to your machine gun collection, if not as vital as Thunderlord or Super Good Advice. It has weak range and a godawful reload speed, but on the plus side its initial burst of fire comes out a higher rate – which you can definitely exploit by fanning the trigger – and prolonged fire gives it better range and accuracy, while also feeding you extra grenade energy for kills. A gun with definite downsides, then, but one that can also deliver great results if you learn to master its kinks. As ever, Xur will be around until 10am UK / 2am PT on Sunday, at which point he’ll be away for another week. So look sharp.